You are driving down the highway when suddenly you have car trouble. The National Safety Council suggests the following measures when your car breaks down or has a flat tire on the highway. At the first sign of car trouble, gently and smoothly take your foot off the accelerator. Do not brake hard or suddenly. Carefully work your vehicle toward the breakdown lane or the side of the road. If you are on an interstate, try to reach an exit. Signal your intentions to drivers behind you. If it is necessary to change lanes, watch your mirrors and the traffic around you closely. Once off the road, make your car visible. Put reflectorized triangles behind your vehicle to alert other drivers; use your emergency flashers. If it is dark, turn on the interior dome light. When you have a flat tire, be certain that you can change it safely without being close to traffic. If that is possible, change the tire as you normally would. Remember, safety must take precedence over your schedule or whatever other concerns you may have. 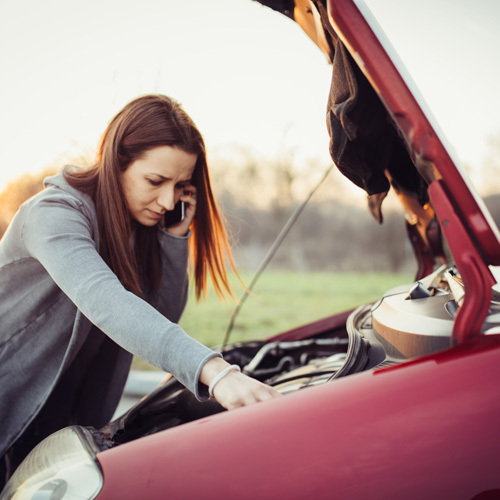 However, when the car is beyond repair, it is best to get professional help. Do not try to flag down other vehicles. Raise your hood and tie something white to the radio antenna or hang it out a window so police officers or tow truck operators will know help is needed. Don’t stand behind or next to your vehicle. If the car is in the roadway, stand away from the vehicle and wait for help to arrive. If your car is safely out of traffic, wait inside the vehicle with the doors locked. Use your cellular phone to call for help. If someone stops and offers to help, open the window slightly and ask them to call the police. Watch for a uniformed police officer or other emergency personnel. All interstate highways and major roads are patrolled regularly. Also, some highways have special “call-for-help” phones.